Darryll planned to be back on Wednesday morning. He figures two more days to finish everything except the hookups to the gas meter. I figured I needed to have at least one coat of paint on the east garage wall today to stay ahead of him, so my first task after breakfast was to paint the wall. 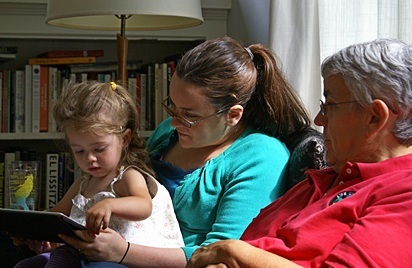 Madeline being read to by Aunt Meghan with Grandma Linda. 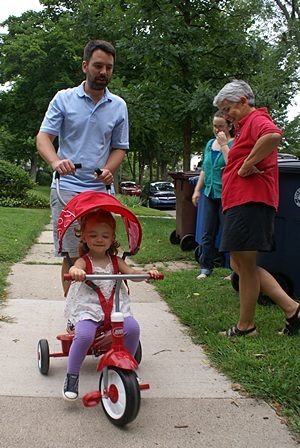 Madeline goes for a ride on her new Radio Flyer tricycle. When I was done with the morning painting I did a light sanding of the drywall compound on the outside of the utility closet walls. After a cursory inspection, I decided it was good enough and went ahead and painted it and then cleaned up the paint tools. I took care of a couple of minor electrical tasks and then sanded the library side of the former window A-C opening and applied some more drywall compound. I cleaned up my drywall tools and by 11:30 AM was done with construction projects for the day. I got cleaned up just in time for lunch. We had left over Koshary, after which we sat outside and read. Linda is reading an e-book titled “Consider the Fork: A History of How We Cook and Eat.” The book is about the intertwined evolution of cooking technique, cookware, and utensils. I started reading the September-October 2014 issue of The Gypsy Journal, which I had downloaded on Sunday and e-mailed to our iPads yesterday. 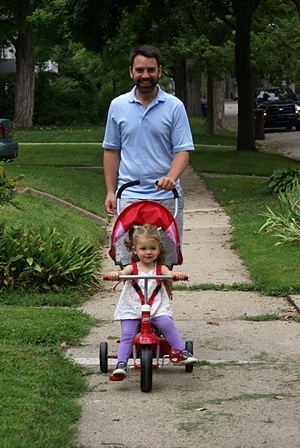 MEF3 steers the Radio Flyer with a little help from her dad. We left around 2 PM for our son’s house in Ann Arbor, making a stop at the Whole Foods Market for some dry ingredients. The reason for our visit was to deliver Madeline’s new Radio Flyer convertible tricycle and visit until time to meet Kate for dinner. Madeline started day care yesterday, which is a really big deal. We were curious how the first two days went, and just wanted to see everyone; I think it’s only been a couple of weeks, but it feels much longer. Today was my lucky day as Madeline decided I was the designated book reader. She has let me read to her occasionally in the past, but usually goes to her mom, dad, aunt, or Grandma Linda, all of whom she has spent more time with than she has with me. It made for a very special afternoon for Grandpa Bruce. The Radio Flyer tricycle even has a sunshade! We left Brenda and Shawna’s house around 5:45 PM and found ourselves in the middle of the evening traffic jam on eastbound Washtenaw Avenue. We slowly worked our way east towards US-23 and then turned into a strip mall to pick up some disposable paint tray liners at an ACE Hardware store. We got back into the traffic flow using a street at the end of the strip mall that had a traffic signal. 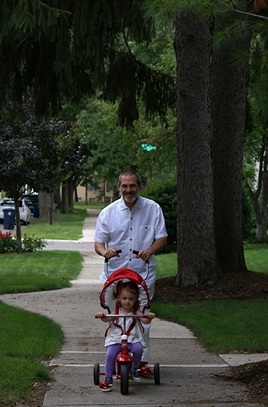 Once we were back on Washtenaw Avenue we had more reasonable traffic flow the rest of the way in to Ypsilanti. After weighing several options, Kate chose the Wurst Bar in Ypsilanti for dinner. Linda had been their once before with Kate but it was my first visit. It was well rated on Yelp and the menu had several vegan options. They also had one of my favorite beers, the Lindeman Framboise, a raspberry lambic ale brewed in Vlezenbeek, Belgium. They were out of the Lindeman but had another lambic from a different producer. It came in something that looked like a large sparkling wine bottle and cost $15, so Linda and I split it. Long before hops were used in beers they were seasoned with fruits and vegetables. I’m not a big fan of hops, but I like fruit. The substitute was OK, but not what I recalled from the last time I had this at a restaurant in Frankenmuth, Michigan. 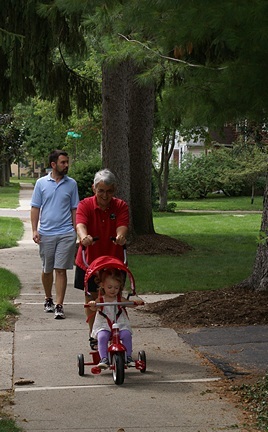 Grandma Linda’s turn to “drive” the Radio Flyer. Kate had recently been to Paris, France and to both Venice and Padua in Italy with one of her nieces and nephews. She had printed about 40 photos (8×10) for us to see. While these are inherently beautiful places her photography was, as usual, superb. The Wurst Bar serves “tots” instead of French fries. Linda and I had some as an appetizer with vegan sausage crumbles, vegan cheese, and sliced jalapeños. Not health food, to be sure, but at least no animal products. For dinner Linda had the vegan wurst and I had the Asian tofu burger. Kate had a regular wurst and a dark beer on tap that she had not had before. She really liked it, but I did not catch the name. It’s finally Grandpa Bruce’s turn to drive the tricycle. By the time we were done eating the lights had been turned down and the music volume had been turned up, so we moved to Sweetwater Coffee and Tea a couple doors down the street. We all had coffee and to our delight they had a piece of vegan apple pie, which Linda took, and a piece of vegan mixed berry pie, which I took. I really like fruit pies but they have always been a rare treat; all the more so now that we eschew animal products. So tonight I had fruit beer and fruit pie. I had planned to put a second coat of paint on the garage walls when we got home but the lateness of the hour disabused me of that idea and I went to bed instead. 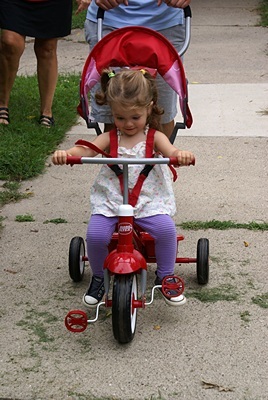 Madeline shows her new tricycle to he mommy. It’s not a Subaru, but it’s pretty cool. This entry was posted in Family-Friends-Home, Photography, Projects, RV-Travel, WFPB and tagged ACE Hardware, apple pie (vegan), Asian tofu burger (vegan), Brendan, Consider the Fork (eBook), drywall work, garage project, Grandma Linda, Grandpa Bruce, Kate de Fuccio, Koshary (WFPB), lambic raspberry ale (Belgium), MEF2, MEF3, Meghan, mixed berry pie (vegan), Padua (Italy), Paris (France), Radio Flyer tricycle, Shawna, Sweetwater Coffee & Tea (Ypsilanti MI), The Gypsy Journal, vegan wurst, Venice (Italy), Whole Foods Market (Ann Arbor MI), Wurst Bar (Ypsilanti MI) on 2014/08/26 by BRF.